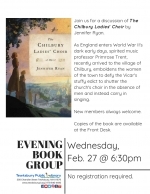 Join us for a discussion of The Chilbury Ladies' Choir by Jennifer Ryan. As England enters World War II's dark early days, spirited music professor Primrose Trent, recently arrived to the village of Chilbury, emboldens the women of the town to defy the Vicar's stuffy edict to shutter the church's choir in the absence of men and instead carry in singing. New members are always welcome. Copies of the book are available at the Front Desk. No registration required.